ACORN CONTROLS VALVES were brought to the market with these objectives: to satisfy our internal shower and tempering valve needs, e.g. Acorn ShowerWare, WashWare, Safety; to offer the market a product superior to what is currently available; and to seize the stand-alone opportunity offered up by direct competitors whose product development is lacking and/or support is seriously weakened. Above all, we were determined to deliver the highest level of bather safety & comfort. When you recommend Acorn Controls, you know you are recommending the highest quality product on the market today. Acorn trusts that everyone involved in bringing our Acorn Controls valves to market will share in the benefits of achieving these goals, but most importantly our valued customers who use them every day. WHAT’S MISSING FROM THIS EMERGENCY VALVE? Here’s a hint: Look at the arrows in the image to the left. Where are the check-stops, you ask? Well, you should know by now that Acorn’s Emergency Tempering valves (ET71 series) have no check stops, unlike every other emergency valve on the market. It’s the “stop” part of a check-stop that’s a problem. Both the ASSE 1071 and ANSI Z358 emergency fixture standards say that “...provisions shall be made to prevent unauthorized access…” to any service stops installed in the supply lines. Since we have no service stops integral to our valve, no provision (no extra cost) is necessary to prevent access. With competing valves, anyone with a screwdriver or Allen wrench has access to the stop function, in violation of the standards and any code that refers to them. But what if the engineer still wants a shut-off? Should you specify service stops, our lockable ball valves (option BVS) provide full compliance after a padlock is added… and we’re still at a competitive sell price. More importantly, the lockable feature signals the need to lock them open, a benefit the installer would be hard-pressed to omit. Therefore, the chances they’ll be exposed to unauthorized access or left closed is greatly reduced. Another advantage Acorn offers is that a ball valve inadvertently closed is easy to spot and address because the handle is perpendicular, not parallel to the flow. No one can easily spot if a check stop has been left closed, so it stays closed. The bottom line: While competitive Emergency Tempering Valves are required to be installed in cabinets with a lock, or placed where no unauthorized person could access them, Acorn’s ET71’s are in full compliance with both standards right out of the box. Whether or not you include the inlet ball valves and outlet temperature gauge, Acorn offers the safest line of emergency valves on the market with the simplest, most reliable (patented) design. I bet you can’t remember a time you were glad you were selling the product that was missing a feature every other competitor includes AND (it gets better) claims as a benefit. Try, I’m waiting… still waiting… I thought so. RSV16 & RSV16-LVR KIT NOW AVAILABLE! The upgrade kits used to convert certain Powers valves to, in effect, make it an SV16 will be available beginning January 15, 2015. Keep in mind that these kits include all internal parts, including check stops. The installation instructions are specifically for the conversion, and I would advise that anyone considering a conversion read them completely before ordering these kits. The Powers valves you can potentially convert are the P900 series, the e700 series and the PB410 series. Submittals are available for this conversion in case pre-approval is required. WHAT’S IN STORE FOR ACORN CONTROLS? We’re doing our best to deliver all the products we’ll need for our long-term success. That means a long–term commitment to you and an investment in your success as well. Spending Acorn R&D dollars on new products for Controls (vs. other options) is a business decision that’s easy to justify since our current Controls success bodes well for our future potential. WHAT DOES “ADVERTISED MINIMUM FLOW” REALLY MEAN? With Acorn Controls, the flow rate IAPMO uses to certify the valve to its applicable ASSE standard has no exceptions! No other manufacturer makes that claim, and when it comes to master mixing valves, the difference can be huge. For example: If the MV17-5 were just any other master mixing valve, IAPMO would have certified it from 106 GPM to 53 GPM according to ASSE 1017. Instead, it was IAPMO certified to have accurate control from 106 GPM to 4 GPM, our advertised minimum flow. Assume that a competitor claims a 4 GPM minimum flow for their master mixer with a similar capacity. Should an engineer wonder why they didn’t, like Acorn, have the valve certified at 4 GPM instead of 53 GPM? Isn’t the answer obvious? Acorn outperforms the competition, and IAPMO certification testing confirms it! We understand that making sense of part numbers can sometimes be difficult. The Acorn Controls model numbers were developed so you can easily identify the application and the ASSE standard that applies to each. The FIRST TWO DIGITS represent the application: SV = Shower Valve, ST = Single Temp., MV = Master (Mixing) Valve and ET = Emergency Tempering. The LAST TWO DIGITS are the last two digits of the ASSE Standard. 16 = ASSE 1016, etc. 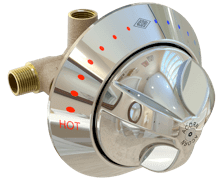 So, the SV16 is our Shower Valve that meets ASSE 1016. When two standards apply, the Single Temperature (typ. 105° F) valve that meets both ASSE 1070 (lav. tempering) and ASSE 1069 (group showering) is aptly named the ST7069. If only we could keep it this simple for the SV16 accessories! Our online MV117 valve sizing program: Accessed at the Resources link, it’s the best way to select the correct valve for your applications and site conditions. A core team of people with over 40 years’ experience in thermostatic mixing valves—I’m including people who moved from other responsibilities at Acorn to work on the Controls line when development started nearly 4 years ago. To make it even easier for you to access the tools when you need them, our website has been redesigned to be accessible from all mobile devices. Please take just 5 to 10 minutes today to familiarize yourself with our website from your preferred mobile device. Call or contact Acorn Customer Service or Joe Penza (908-461-8764 or jpenza@acorneng.com) if you need help learning to use any of these tools.